Obtaining residency in a foreign country is one of the most important benefits of buying real estate abroad. I write frequently about obtaining residency through property purchase, and the examples of good programs are almost always in Latin America. But now it’s Europe’s turn… specifically, Portugal. Portugal has a program called the Golden Visa program, which targets the foreign investor and property buyer. For the average buyer with no family connections in Europe, it’s the best residency program that I know of right now. Here’s why the Portuguese Golden Visa program is so valuable today. First and foremost, Portugal is a great place to live, so residency there is naturally attractive. 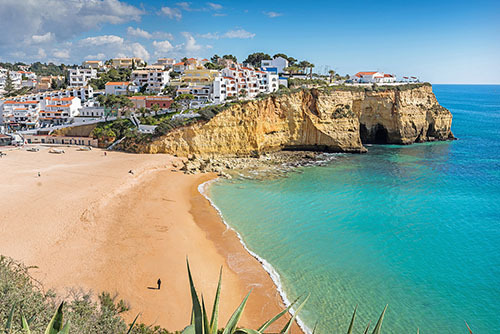 The Portuguese claim to have the best beaches in Europe and boast their moderate weather and abundance of sunshine. Also, Portuguese properties are a good deal at this time, as they still have not come back from the last recession and property crash. And to top it off, the U.S. dollar is relatively strong against the euro these days, making properties significantly less than they were just a few years ago. Finally, when you become a resident of Portugal you have access to all 26 European countries in the Schengen area. Signed in 1985, the Schengen Agreement pre-dates the European Union and created a “borderless” zone in order to allow visa-free travel among the signatory countries. Originally, the agreement included the 10 members of the European Economic Community and became EU law in 1999. When you obtain a visa under this program, you will be eligible for permanent residency after five years and for Portuguese citizenship after six years. And as an additional benefit, these visas allow you to include family members. Plenty of visa options available to the North American buyer. When I started researching this essay, I found plenty of misinformation online. The majority of the blog posts out there were mostly right at one time, but few of them were updated to reflect all subsequent changes to Portugal’s immigration law since the Golden Visa program was introduced in 2007. As with any country, the only valid source for visa requirements is the Portuguese government. There are about 10 ways in which you can obtain an investor’s visa in Portugal under the Golden Visa program. These vary from million-euro bank transfers, to the creation of 10 jobs, to investing in artistic or cultural activities, to investing in a new business. But today, we’re going to focus on ways in which you can get residency by buying real estate. Let’s walk through each alternative. 1: Transfer a million euros to Portugal. This is not a property purchase, per se. The reason I mention this option is that the million-euro transfer is unrestricted, with no caveats on how you can spend it. This option may be good for someone who wants to buy one or more properties, perhaps invest some, and save some for future living expenses. 2: Spend 500,000 euros on any property. You can buy a property of any type anywhere that costs 500,000 euros (US$568,000). 3: Spend 400,000 euros on any property in a low-density or depressed area. If you buy in a low-density population area (i.e. in the countryside) or an economically depressed area, then the minimum unrestricted investment above is 20% less, or 400,000 euros (US$454,500). 4: Spend 350,000 euros on an older property or in a “rehabilitation” zone. 5: Spend 280,000 euros on an older property or in a “rehabilitation” zone., that’s in a low-density or depressed area. This 350k euro threshold above is lower if you buy in a low-density population area or an economically depressed area. In these cases the minimum is 20% less, or 280,000 euros (US$318,000). Rehabilitation costs are included towards your minimum with this visa. So your 350k euros (or 280k euros) can be the sum of the purchase price and the cost of fixing the property up. The qualifying property may be jointly owned provided the applicant contributed the minimum investment. Also, the property may be owned by a one-person structure, such as an LLC. Here are the general requirements for any type of residency visa in Portugal. Prove that you have a clean criminal record in Portugal and your country of origin (you’ll be turned down if you’ve done more than a year’s jail time, according to the international law firm NDR, who specializes in Portuguese residency). Before applying for a visa, you must create an online account and pre-register, so that you can submit the remaining documents online. If you’re doing the process yourself, register here… if you’re using a lawyer or personal representative, have them register here. When you’re ready you can download the visa application here. Here’s what I believe is the best real estate opportunity that qualifies for a visa. The visa that holds my interest is the 350k/280k-euro minimum investment, because there’s opportunity there. To qualify, you can buy a property that’s more than 30 years old, or you can buy in a designated urban rehabilitation area (called an área de reabilitação urbana, or ARU). Either way, you’re probably adding value to a place that needs some work. (At least that’s the idea… not every 30-year-old home will need work.) And if you’re adding value through restoration, you stand to make a nice gain. But in a rehabilitation area (ARU) you’ll do even better, because not only are you adding value to your property, but the government is also incentivizing your neighborhood’s rehabilitation. This multiplies the power of your visa investment. 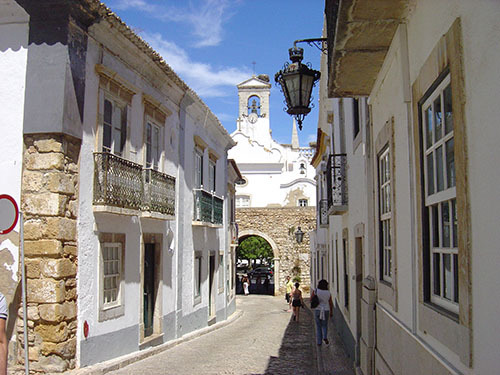 What surprised me is that even the popular Algarve coast has designated ARUs, in places like Faro’s historic district. Follow this link (http://www.portaldahabitacao.pt/pt/portal/reabilitacao/homearu.html) to have a look at Portugal’s ARUs. My favorite ARU for investment is overlooking the marina in Faro’s historic center. Is the Golden Visa program for you? If you want to open the door to Europe, this is a great opportunity. Granted, the investment threshold in Europe is a lot higher than you can get away with in Latin America… An investment of 280k euros is still a lot of money. But if you’re bound for Europe—and you want a chance to profit while obtaining residency—then the Golden Visa program may be just right for you. Editor’s Note: The Golden Visa program is one of the many topics we’ll cover at our second Live and Invest in Portugal Conference this July. The Early Bird Discount for this event is currently in effect, meaning that you save at least $250 when you register now. Full details of the event we have planned for you are here. I’ve followed your comments/recommendations with enthusiasm. I find my experience living in Oaxaca and Jalisco agrees with most of your observations on Mexico. But I’m attracted to the Dominican Republic because my goal is a change of citizenship and the DR has the easiest and shortest program for a passport and citizenship. Since I’m in my late 80s I don’t have the time to work with as if I were 60. Although I’ve read the Social Security rules they don’t seem to be really clear as to whether or not one is entitled to their SS benefits (unless you’re an ex-green card holder), do you know any expats who have terminated their U.S. citizenship who still get SS benefits? If you give up your U.S. citizenship, you are still entitled to receive your Social Security retirement benefits. You would lose a military pension but not social security. As a non-citizen and non-resident of the U.S., the government will withhold 25% of your Social Security check, unless the country you reside in has a tax treaty with the U.S. (The Dominican Republic does not.) Here are the countries that do. Incidentally, the DR is also not a Visa Waiver country, so you’ll need to apply for a visa in order to visit the States if you’re no longer a citizen. Let me express my sincerest gratitude for sharing your wealth of information and experiences with overseas real estate investments. I’m currently looking into the Puerto Peñasco area of Sonora, Mexico, on the eastern shores of the Sea of Cortez across from Baja. Beachfront lots are still available from US$150,000–US$250,000 with construction costs of US$150,000 for a beautiful 3,000 square-foot home. Also, US$300,000–US$400,000 beachfront homes are very attainable there and very tempting. I’m told by a local agent there are plans for a cruise line port in two years, with an anticipated increase in international flights thereafter. Lots of promising info, but I’m concerned whether the area will really see some growth as claimed. I like the Puerto Peñasco area as it provides a lot of advantages, being only 45 minutes from the U.S. border. Can you offer any input? I think Puerto Peñasco is worth looking at as a second-home destination, especially if you live in the western United States. But I think Jorge is right to be skeptical. As Jorge says, Puerto Peñasco is only 45 realtor-minutes from the U.S. border (1 hour, 15 minutes actual clock time), so it’s very easy to return to the States to buy things, to get medical treatment, or to use Medicare. Beachfront properties are reasonable (I saw them as low as US$109k last year), and the town has an active tourism industry, with more than 2 million visitors per year. And they are indeed building a cruise port, intended to be a “home port”… meaning that cruise ships will depart from there. Construction began last year. As of now, I don’t know of any cruise companies who’ve signed up to use it. They seem to be waiting until the facilities are finished. If this project is successful, it will bring more than US$100 million in new spending to the local economy. And as Jorge points out, service to the airport would likely be expanded to accommodate travelers departing on a cruise from Puerto Peñasco. Buying in Puerto Peñasco would be a good “path-of-progress” investment. If it pans out, it will pay handsomely. But the project’s success is far from a sure thing. These public works projects never are. I would suggest checking out Puerto Peñasco to see if you’d like having a second home there. If the port project is successful, you’ll have an excellent investment on your hands. If not, you’ll still have a place you’ll enjoy owning or renting out.